If you have not been able to tell, one of my top role models and mentors is Dr. Hugh Winder Nibley, former BYU professor and highly esteemed LDS scholar. He was and is still considered the foremost LDS scholar and apologist of this century, and perhaps of all time. And he was a genius. Once at a Biblical Society meeting the Jesuit scholar George MacRae, former dean of the Harvard Divinity School, heard Hugh expound lengthily on a Greek text without notes including sporadically quoting thirty lines of the original, for which MacRae covered his face and confessed – “It is obscene for a man to know that much”1. 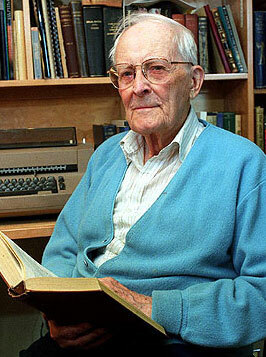 Hugh Nibley passed away in 2005 at the age of 94. During the early stages of FARMS, Jack Welch began to consider producing a documentary about Hugh’s life and work. Jack felt that a good production could be done for the modest sum of about five thousand dollars. The idea took on a life of its own, led to hundreds of hours of personal interviews with Hugh, his family, friends, associates, and consumed a budget of a quarter-million dollars. Welch approached Hugh’s son, Alex, who had studied at the American Conservatory Theater and was working at Sundance on what would later ecome the Sundance Film Institute. Alex liked the idea and talked it over with his supervisor at Sundance, Sterling Van Wagenen. Soon they added a cinematographer named Brian Capener to the team. As they began to plan the film, Alex hoped it would show the more conversational side of his father. “I wanted to show the public part of what I saw in private,” stated Alex. But cooperate he did, and the documentary became a profound success. I think far too many people inside the Church and out have ignored the weighty contributions of the scholarship and faithful example of Hugh Nibley. You can watch the full documentary “Faith of an Observer” by clicking this link. Also, Nibley’s newest book Eloquent Witness is said to have a transcript of this video. Detail from "Alma Baptizes in the Waters of Mormon" - Minerva Teichert - 1935 ca. Note: This is a comment I made on my last post, but I thought it was pertinent enough to make it into a post of itself. The concept of “keys” is not absent from the Book of Mormon. Whenever God has chosen to give authority to man to perform ordinances in His name, it has been by ordination and a dispensation of keys. You may have wondered where I’ve been lately. I haven’t posted any substantial posts over the last few days. But, no need to worry. I have assigned myself a fairly large side project that I believe will be of worth to researchers, historians, students, and anyone wanting to learn more about the prophet Joseph Smith, and the historical beginnings of the LDS Church and Mormonism. It will be a small extension of Richard Bushman’s landmark biography of the prophet, Joseph Smith: Rough Stone Rolling. Anyone who has read Bushman’s biography I think will be particularly appreciative of it. I don’t want to go into too many details now, but just wanted to let you know my posting will probably be minimal until I finish this project, which I hope I’ll be able to do before the FAIR Conference on August 7-8, which I am excited to attend. That might be an unrealistic goal for its scope, but I’m attempting it. Once I’m done, the results will be accessible here at TempleStudy.com. In the meantime, there might be some posts in the archive that you might not have seen yet.